Eight students from the Diversified Occupations (D.O.) program at the Hannaford Career Center in Middlebury, Vermont are coming to the LCMM boat shop four days a week through May to build a 32’ pilot gig. They are accompanied by D. O. teachers Wendy Lynch, Betsy Stine and Jim Doolan. LCMM boat builders Nick Patch and Andrew Lang are the boat shop instructors. This boat, the thirteenth rowing gig built at LCMM will be launched on May 19th. To see what the students go through, take a look at this article from Wooden Boat Magazine, highlighting the program. The gig will be added to the LCMM Champlain Longboats fleet which provides in-school and after school programming for over 400 regional students annually. Let us know if you have questions, want to volunteer or just want to come out and see the action. 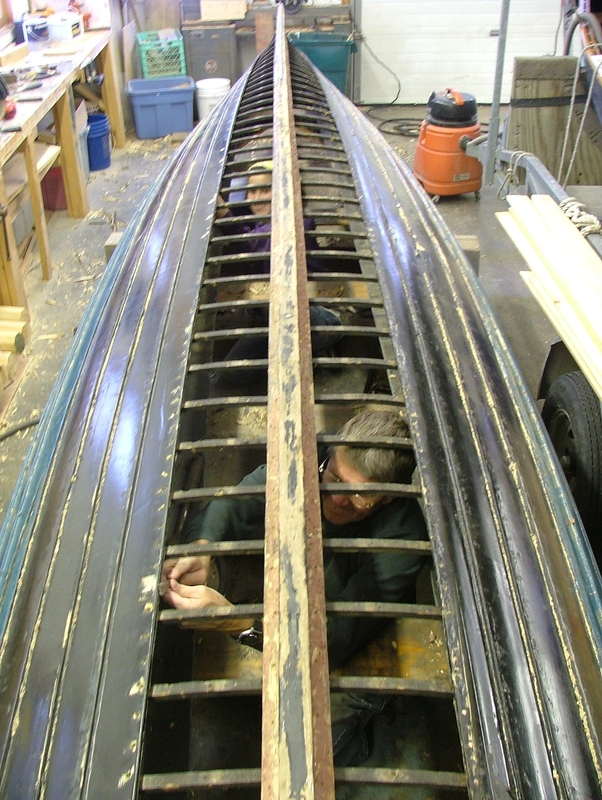 Volunteers Jon Woodbury and Lianna Tennal have been working on the 32’ pilot gig Triton in the LCMM boat shop. We are replacing her garboard planks, originally made with white pine, with 9mm Sapele marine plywood. This is a method we have adopted to eliminate issues around cracking garboard planks. Maintenance on our fleet of eleven gigs is ongoing simultaneously while we build a new boat and volunteers, students and staff work on fleet maintenance in addition to new construction.